Do Wiccans have rituals like communion, baptism, etc? Yes. However, it generally involves a direct encounter with the God and Goddess, rather than an indirect experience routed through a priest, minister or other clergyperson. Many Wiccans observe a Wiccaning service for infants, which is vaguely like a Christian baptism. It welcomes the newborn into the community. However, it does not obligate the infant in any way. Wiccans feel that a person must mature before they can make their own decision about religion; an infant cannot make such a choice. Many Wiccans bring their children up learning many different beliefs in order for them to be able to make an informed choice and to be tolerant of others. There are initiation rituals where a person becomes a Wiccan. Some are self-initiation rituals where a person declares himself or herself to be a Wiccan. There are other initiation rituals performed in a Wiccan group, often called a Coven. Many Wiccans write rituals for themselves or their coven to recognize life passages, like the onset of puberty, graduation, marriage, purchase of a house, divorce, healing, death, menopause, etc. Many Wiccans observe Esbat rituals at the thirteen or so full moons each year, and occasionally on the new moons as well. 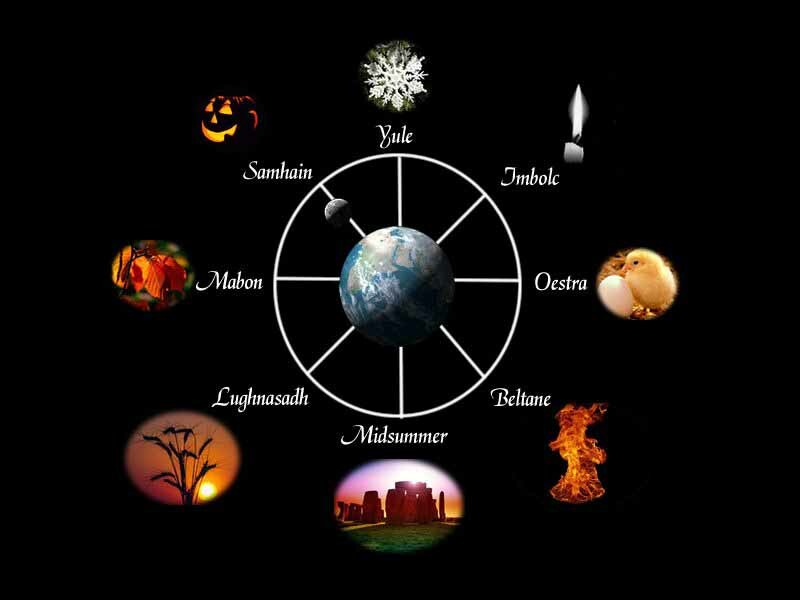 There are eight Sabbats: four minor Sabbats at the solstices and equinoxes, and four major Sabbats each year. Below is a picture of the different Sabbats and Esbats and a visual representation of the approximate time of year for each. Please click on the symbol to learn more. How do Wiccans worship the God and Goddess? What do Wiccan rituals involve? · The casting of a circle — the consecration of a sacred space. · The body of the ritual, which may involve magick, spell casting, a community meal, dance, readings, singing, etc. · Closing or banishing of the circle — restoration of the space to ordinary usage.